Circuit: Double Conversion Physical: 13.2 x 5.25 x 13" 13 Lbs. Features: ¼" Head. Jack, S-Meter, PBT, Preamp, IF Notch, AGC, BFO, 1000 Alpha Mems., Sync. Detect., Tone, Dual Clock Timers, RF Gain, Recorder Activation, RS232 Port, Scan, Sweep, Keypad,	Squelch, Dual VFOs, Speaker Switch, Line Output, Attenuator. Accessories:	MS-8 Speaker, VHF Converter. Comments: Ergonomic and performance improvements over the R8A include: faster scanning, sideband selectable synchronous AM detection and 1000 alphanumeric memories. ¹Later production units tune from 10 to 30000 kHz. Click here to view color photo and more info. or click here to view sold archive at Universal Radio. Circuit: Double Conversion Physical: 10.75 x 5.5 x 12.25" 14 Lbs. Features: ¼" Head. Jack, S-Meter, IF Notch, Preselector, RF Gain, Mute, Dial Lamp, Dial Lamp Switch, Spinner Knob, Audio In-Out Jack, Anti-Vox Jack. Accessories:	AL-4 LW/MW Loop, MS-4 Spkr, 5NB NB, SCC-4 Cal, FS-4 Synthz. Comments:	Ranges: .15-.5, .5-1, 1-1.5, 6-6.5, 7-7.5, 9.5-10, 11.5-12, 15-15.5, 17.5-18 and 21.5-22 MHz plus 14 additional 500 kHz crystal positions. Dial accuracy is ±1 kHz. 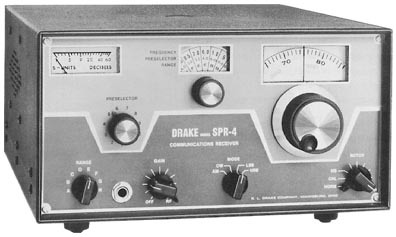 Drake's first completely solid-state receiver. Click here to return to the Table of Contents. Click here to view the Universal Used Equipment List. ©1999-2007 by Universal Radio Research. All rights reserved.